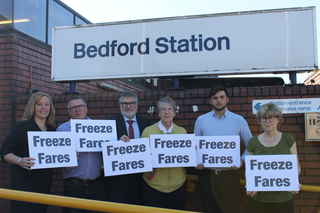 Bedford Borough Liberal Democrats have today launched their campaign to freeze fares for Bedford rail users. The Government has announced another fare rise for January, with 'regulated' fares rising by over 3%. However, Mayor Dave Hodgson and local Lib Dems are calling for an immediate freeze for Bedford rail users due to the downgraded and failing services they are suffering. The removal of all fast intercity peak time services to London in the morning and from London in the evening for at least two years. The failure of the new Thameslink timetables, which have caused daily misery since the first attempt to introduce them in May. The decision by the Government to almost entirely remove Bedford from its historic place on intercity rail network under the next East Midlands rail franchise, starting in 2019. Commenting, Mayor Dave Hodgson said: "There is absolutely no case for local rail users to pay higher fares, when by any measure they are suffering worse services. Bedford Borough rail users have been failed by the train operating companies and by the Government, and the misery is ongoing. That's why the Government must step in, reverse the planned fares increase and announce a freeze immediately."